← Government’s Response: Extending EU Ref. Voting Rights to All UK Citizens Living Abroad. Here’s the latest assessment of the direction of the polls for the EU Referendum by Matthew Goodwin, Professor of Politics at the University of Kent. That the race between the “Remain” and “Leave” camps has tightened recently is reflected in the chart below taken from his article. This reinforces his point that there is still everything to play for on both sides of the debate. The message for British expatriates, therefore, is that if you still have the right to vote in this EU Referendum (after less than 15 years since leaving the UK), make sure that you can by registering to vote on www.gov.uk/register-to-vote. This entry was posted in EU Ref Odds-Ladbrokes March 2016, EU Ref: April Polls Show Tightening, Impact of Brexit on 2 mill Expat Brits, Undecided Voters in EU Referendum, Voting Rights, Worried about EU Referendum? and tagged 15-year-rule, British expatriates, EU Referendum, voter registration. Bookmark the permalink. 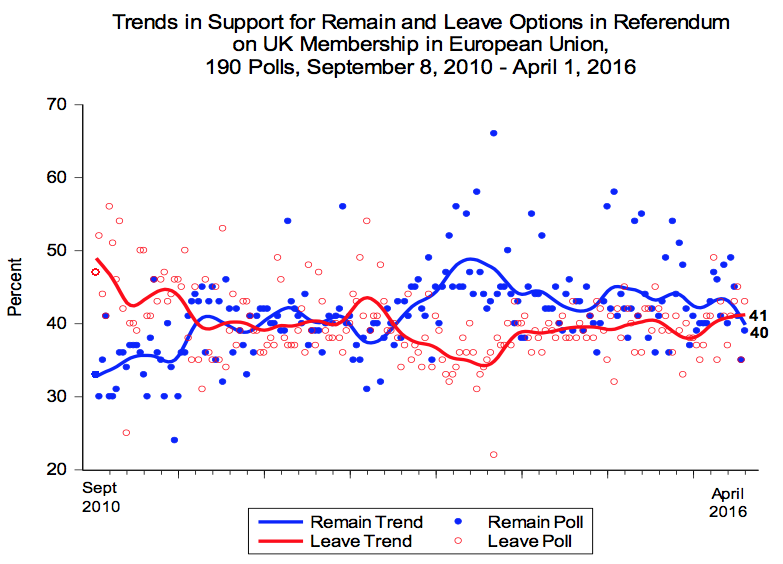 1 Response to EU Referendum: April Polls Tightening – Make Sure You Can Vote!